Many beer lovers will attest that the cooler seasons are the best time for beer. Come early autumn, darker, heavier, maltier beers have saturated the market, along with seasonal brews crafted with coffee, pumpkin, vanilla, molasses, and the spices you’d find in a good apple pie. To the beer lover, porters, barleywines, and imperial stouts are synonymous with Halloween candy and Thanksgiving dinner. As the leaves turn and the days crisp around the edges, Two Roads Brewing Company in Stratford, Connecticut is an apt destination for beer lovers with a hankering for fall beers and limited releases. Time your visit right and you’ll find The Spud Stud food truck in the brewery’s parking lot–they make a killer Thanksgiving stuffed potato, the perfect meal to pair with Two Roads’ fall beer selection. Two Roads is housed in a 100,000 square-foot, 100-year-old brick factory just off of Interstate 95, the former site of the metalforming factory U.S. Baird. After refurbishing the rustic, centurial space and preserving all of its industrial charm (including a huge, trough-like, foot-pedal-powered sink in the middle of the tasting room’s unisex bathroom, complete with Borax dispensers), the founders–including brewmaster Phil Markowski–opened the brewery in December of 2012, realizing the dream they had collectively conceived more than two decades prior. Since opening, Two Roads has expanded three times, with another expansion in the works for next year. The brewery is currently operating at full capacity, and once additional fermentation vessels are installed this coming spring, they’ll be able to produce approximately 125,000 barrels of beer per year–just under 4 million gallons. This notion of doing things a bit differently is at the heart of Two Road’s brewing philosophy. “I have what I feel is a healthy respect for traditional beer styles, but I also like to alter them and put our own spin on it so that it’s unique to Two Roads,” said Brewmaster Phil Markowski during a phone interview in late October. For example, Two Roads’ Ol’ Factory Pils is a traditional German Pilsner in every way, save for a period of dry-hopping during the beer’s aging cycle. While dry-hopping is a common practice with ales, it isn’t with lagers, and according to Markowski, such a treatment would never be considered for a true German-brewed Pilsner. Two Roads’ Saison is available all year, while other breweries regard it as a summer seasonal. Road 2 Ruin, the brewery’s popular Double IPA, is crafted with Summit and Palisade hops, lending the beer a tangerine and pine character atypical to the style. And perhaps most demonstrative of Markowski’s knack for innovation is Philsamic, a special release from Two Roads’ “The Road Less Traveled Series,” under which four brews are produced each year. Philsamic, which commemorates Markowski’s 25th year of brewing, is one of three beers in Two Roads’ brewery-only “Sourcopia” trifecta, none of which are likely to be available at the time of this article’s publication. Only five hundred 750 milliliter bottles of Philsamic (which feature a label with Markowski’s spectacled likeness arranged from dried pasta) were released at Sourcopia on Saturday, October 25th, and supplies were expected to sell out in a matter of hours. The other beers from the triad included a sour farmhouse Gueuze and a double-fermented sour cherry Kriek. 700 bottles of each of these lambics were available for purchase, and all three were also available on tap in the tasting room, where there’s an infinitesimal chance you might still be able to enjoy a pour come the beginning of November. 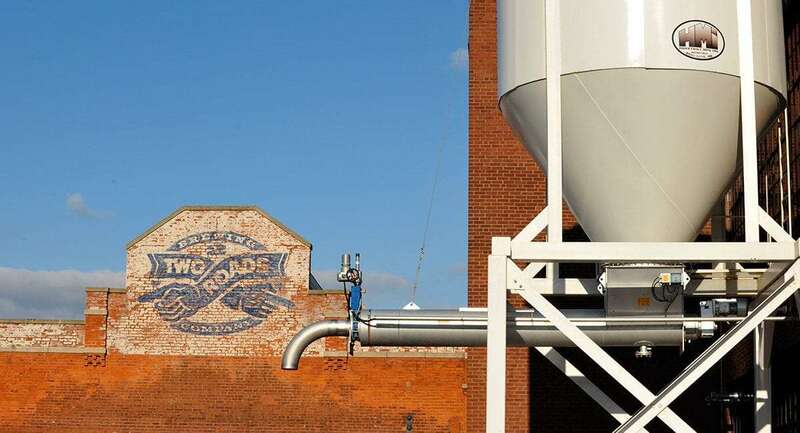 Tours of Two Roads’ brewing facilities, held on Fridays, Saturdays, and Sundays, are not to be missed. For $5, tour-goers get an extensive 45-minute to an hour-long walk-through of the brewery, complete with well over $5 worth of beer sampling and an open forum for questions on all things beer. Two Roads also showcases acoustic music acts in the tasting room on Tuesday evenings, and their outdoor beer garden will be open as long as the weather holds out – so bundle up, grab a glass of your favorite seasonal, and drink up as you drink in New England’s autumn air. Via their website or point your headlights toward Stratford, Connecticut. An interview with WBCCI’s International Marketing Chairman, Fred Richardson, on what exactly this Airstream Club does.